Tetsu Ted Hasegawa in United States Army uniform stands with arms behind his back in front of arbors at Rohwer concentration camp at Rohwer, Arkansas, October 16, 1944. Dressed in slacks, shirt, necktie, overseas hat and eyeglasses, the man looks didrectly at the viewer. A large shrub is partially visible at left; dirt walkway extends from foreground into background between two vine covered arbors. 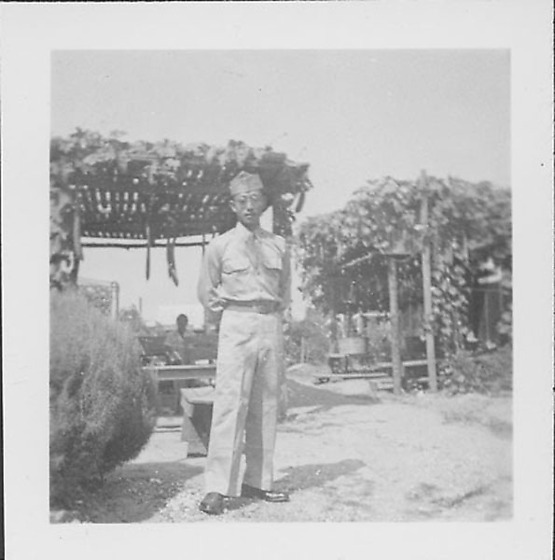 A figure sits in shade under arbor, left. Stamped in black ink on back: OCT 16 1944.